Here is the page for my point cloud display and extract tool, it’s also the production blog for independent study for Prof. Malcolm Kesson. Will update the blog whenever I have any progress. I read this book last quarter and got the basic ideas of Maya API. Boost is a C++ library for efficiently use of some C++ data types. I interned at Digital Domain and the Technical Directors there are using boost extensively. 2. Figure out how the “make” file works. 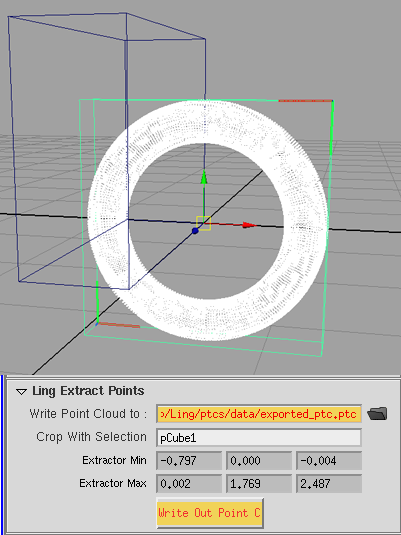 I will work in Linux env, and the Double Negative point cloud tool shipped with a “make” file to build the plugin. Will try to figure out how it works and adjust it to fit my need. followed the instruction, downloaded and installed “cmake 2.8″ on a machine at Mongometry Hall. 3. Compile the tool, implement it based on my need. I downloaded boost, the library I need to use doesnt need to be compiled, so I can put is anywhere in the harddrive. So after some try-outs I found copying the “boost” library folder into “<maya_install_folder>/include” folder is the easiest way to make this link work. 2. Installed cmake 2.80, so I can actually make a “make” file. gcc is the “GNU” C Compiler, and g++ is the “GNU C++ compiler, while cc and CC are the Sun C and C++ compilers also available on Sun workstations. Below are several examples that show how to use g++ to compile C++ programs, although much of the information applies to C programs as well as compiling with the other compilers. I changed the compiler to g++, which seems almost working. With the awesome hint from a Hair TD at Digital Domain, I figured out that with Maya API, I have to use a older version of g++. the Ubuntu system at SCAD now is using g++ 4.2.4.
the Maya requires g++ 4.1.2 at most..
After installed the g++ 4.1.2, the source code finally got correctly compiled. Kinda a rough start, but I am already feel happy about it. 1. Add a simple filtering function set. For the efficiency purpose, the original node has an option to display percentages of the points. I looked at the source code and pretty much figured why, will try to implement this as soon as possible. 1.0/0.6 = 1.666667 points per step. However, it’s impossible to skip 1.6666667 points per step. Instead, the original code used “floor()” function to make the float number a interger. And unfortunately, floor(1.66667) = 1, so the original function sets will choose every points in the first 60% of the total points. As a result, I got a logically “wrong” display result, which is been showed above in the second image of this page. 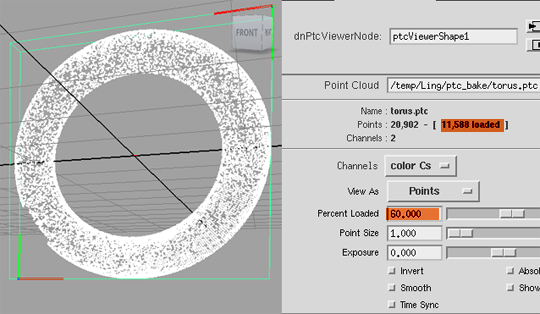 The image above shows the correct display of 60% point clouds. 1. if the percentage is a value like 50%, 25%, 10% …etc. Keep the original algorithm. Because in these cases, the point for each step will be 2, 4, 10 and so on, and which wont cause any coverting float to int problem. 2. any other conditions, will use the implemented algorithm. d. if the float numnber is smaller, do nothing, go to the next point. and the actual point loaded is 11588.
a little bit acuracy has been sacrified for the random number generation. But at least not fully accurate is better than completely wrong..
and I felt a little uncomfortable about it..
and after this, the third time needs to skip (2,2XX-2+1.6667) = 1.8XXX, then skip 1 point..
With this algorithm, the percentage display results are 100% accurate. And I am comfortable enough to go to the next step! 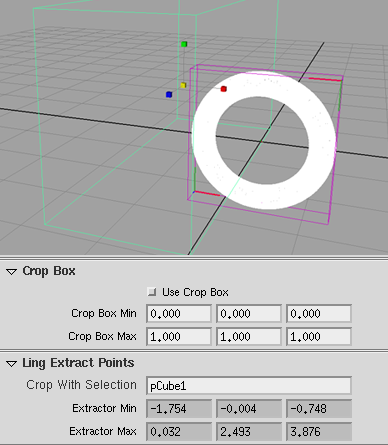 Will try to write an extraction tool, based on a geometry(cube or sphere)’s bounding box. 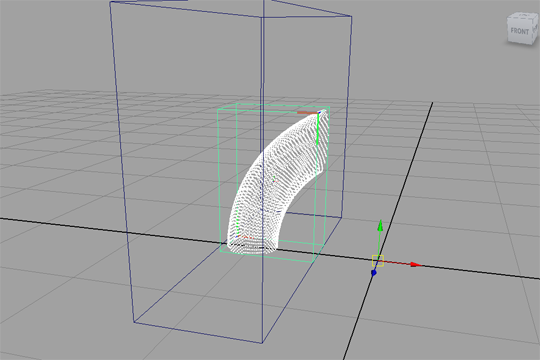 Any points in side that bounding box will be write out seperately as another .ptc file. the fisrt one is getting the current selection in Maya. 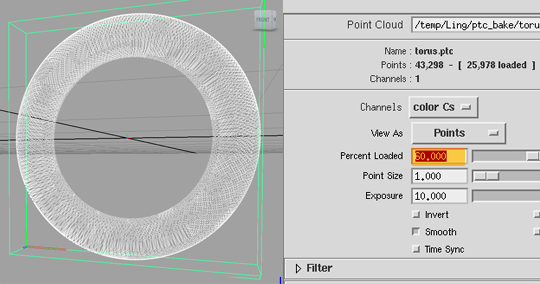 It’s really easy to do in MEL command, but in MAYA API is a little different. Compares to Python code, c++ needs more accurate/clear data type defined. Also the function sets to get the bounding box of a dag node is a little complicated, I omitted the code here. every time is reloads/redraw the node, the bounding box function will be invoked as well. 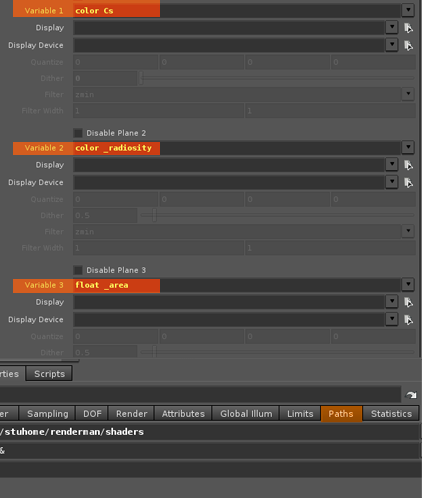 Then I added my custom attr to the node, and connected it to the AE template. The cool, or kinda funny thing about the AE templates is if your node is named : “myNode”, then then AE template has to be named to “AEmyNodeTemplate”. When creating the “myNode” in the scene, the AE template will automatically attach to the node, as long as the namesare matched. After I got the UI/AE template updated, I defined the “compute” function to, if the string in the text field changed, re-compute the extraction’s box based on the typed in geometry. b. A custom hidden attribute (let’s say “aLingChange”)to be affected by all my custom attribute. The concept was pretty simple: if the affecting geometry’s name changes, the “aLingChange” has been affected. the newly updated boundingbox info. However, the affecting and affected calculation seems not working on my custom attrs. I went through a lot of on-line docs, and been posing questions on the Python inside Maya google group. and I tried all the suggested solutions to fix this problem, but didn’t work. or dynamic to dynamic attribute of a node. really interesting. I have to ask the compute() function of a node to compute whenever a input attr changes. It works for my purpose for now, will try to figure it out later if have time. I got the affecting attributes working. For whatever mysterious reason, the Linux system I was using, was not happy with my custom node. Probably it’s usinig a really old system image. If I use any other machines in Montgomery hall, the node affecting attributes works like charm..
As a result, this problem fixed, with no specific reason. b. A click button to execute the extraction process. provided me a really good reference and start. the actually write out function sets is fairly easy. write out the ptc point data. to close the write-out .ptc file. 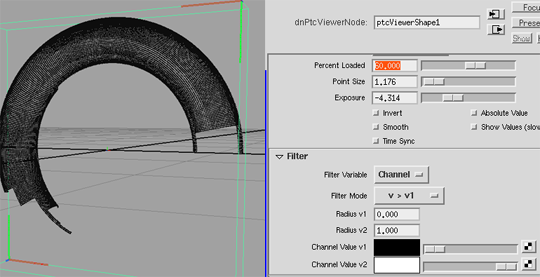 Which was designed to close a Read-in point cloud file. is the last several thousand points will not be written out. be actually written.. Really intersting. to close a write-out point cloud file. And the results are correct since then. It’s a result from 50% density of the original points, and extracted by the cube. I am happi with the result for now..
don’t start the write out process. so if user specify not using extract bounding box, the write out process will write-out .ptc file as it displays. And if set “use extract box” to “true”, it will write out .ptc file based on the displayed points and the extraction bbox. 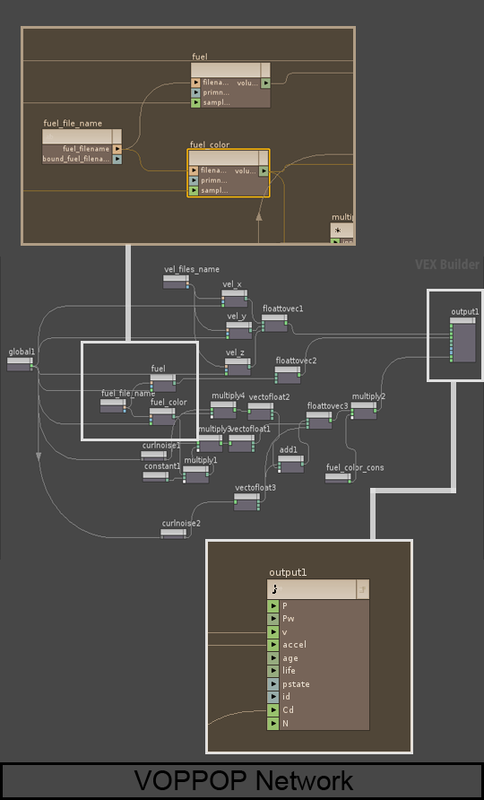 I was fansinated by that and wanted to try something like it..
but fortunately, Houdini is powerful enough to bake lots of info out in its own formats. 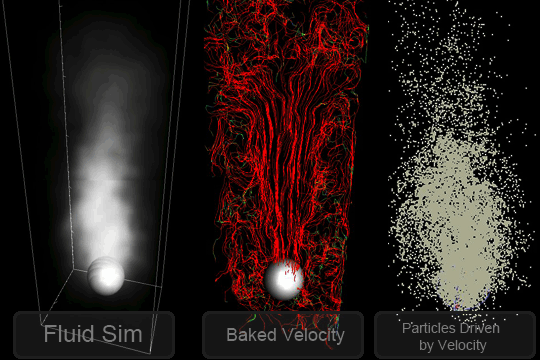 So I baked the velocity info out, and used the velocity info to drive a particle object. from the moving particle points. 2. 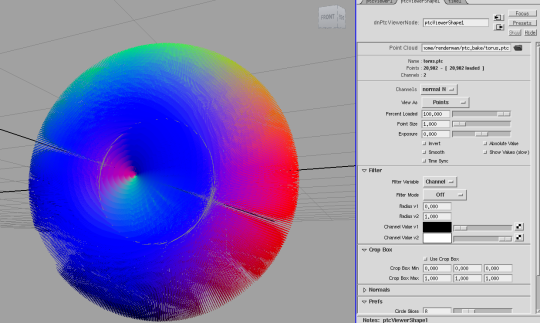 Baked out Cs, _radiosity, and _area info from the particle. a. 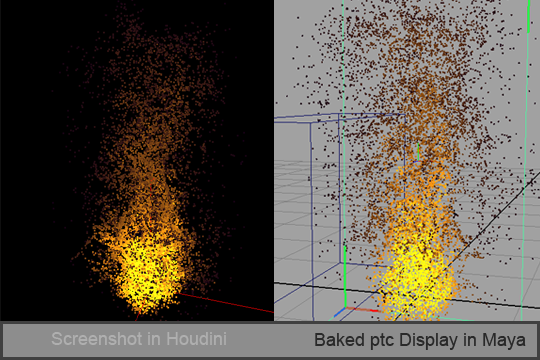 By default, the particle Cs(color of surface), which in Houdini is Cd, is white. So I figured a way to convert the Fuild sim’s “Fuel” info into the Cd of the particle. 3. Baked out PRman point cloud based on the particle. 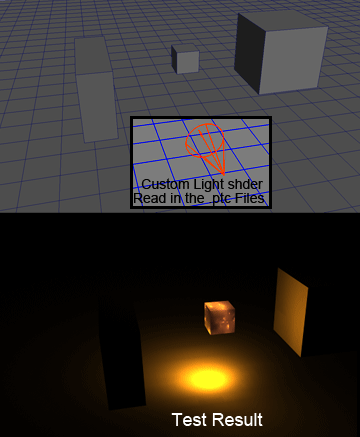 Same of Prman, to bake out Cs, _radiosity, and _area info, AOVs needed to be set up in Houdini. And here is the baked ptc sequence displayed in Maya. The points have dark color indicates fewer fuel and won’t contribute too much in the point based lighting. Then the next step is rendering out with the ptc file. After that, as the test result shows, the problem was at the area that has lots points, the surfaces nearbay will be lit up really unnaturally. Fortunately, the indirectdiffue() function has some options to deal with this kinda situation. are making the result better.